MARGATE, Fla. -- Kimbo Slice, the bearded street fighter who parlayed his internet popularity into a mixed martial arts career and worldwide fame, has died. He was 42. Slice's death was confirmed by Mike Imber, his longtime manager. After gaining viral internet fame at a time when the phenomenon was still relatively new, Slice studied MMA and eventually competed for several promotions, including the UFC and Bellator, which staged his two most recent fights. While he went only 5-2 and never won a championship belt, the personable Slice became one of MMA's best-known figures, attracting large television audiences and crowds to his growing sport. Slice's death also was confirmed by Scott Coker, the CEO of Bellator, which promoted his return to MMA last year after a five-year absence. Slice beat Dhafir "Dada 5000" Harris with a third-round knockout in February at Bellator 149 in Houston, but the result was overturned after Slice tested positive for steroid use. "We are all shocked and saddened by the devastating and untimely loss of Kimbo Slice," Coker said. 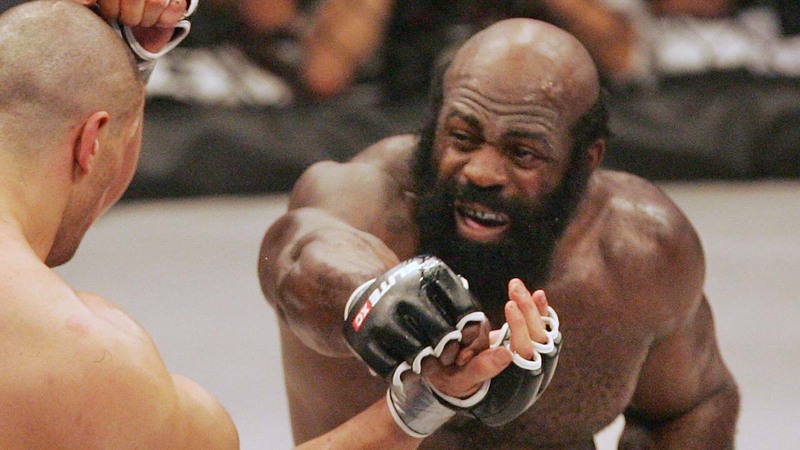 "One of the most popular MMA fighters ever, Kimbo was a charismatic, larger-than-life personality that transcended the sport. Outside of the cage he was a friendly, gentle giant and a devoted family man. His loss leaves us all with extremely heavy hearts." Although Slice never reached the sport's competitive heights, his aura never waned among MMA fans: His bout with Harris four months ago drew the largest television ratings in Bellator's history. "He carried himself as a true professional during his time in our organization," the UFC's statement read. "While he will never be forgotten for his fighting style and transcendent image, Slice will also be remembered for his warm personality and commitment to his family and friends." "The guys who are holding the titles, heavyweight and light heavyweight, these guys are awesome," Slice told the AP in a 2010 interview before his second UFC fight. "I'm really just having happy days in the midst - being among them, fighting on the undercards, just contributing to the UFC and the sport. That's really what I want to do. I'm not looking ahead to winning a title or anything like that. I'm just enjoying each fight as it comes."